What an unlikely pair these two make! 50 Cent was seen hanging with Meryl Streep at Sunday’s Lakers game. Who knew Meryl Streep was so hip? Apparently, 50 Cent knew as he hung out with the legendary actress at Sunday’s Knicks versus Lakers basketball game. The two sat courtside at Madison Square Garden in New York City. They spent their time laughing, holding hands and having a grand old time together at the NBA game. To prove how much fun he was having with the three-time Oscar winner, 50 Cent posted several photos during and after the game. Fiddy is completely a charmer, but before anyone starts to spread rumors about the odd pairing, Streep’s husband, Don Gummer, was there for the entire game. In fact, he was sitting right next to the Devil Wears Prada star, so the actress won’t be hitting 50 Cent’s next tour anytime soon. Next up for Streep is the Oscars. 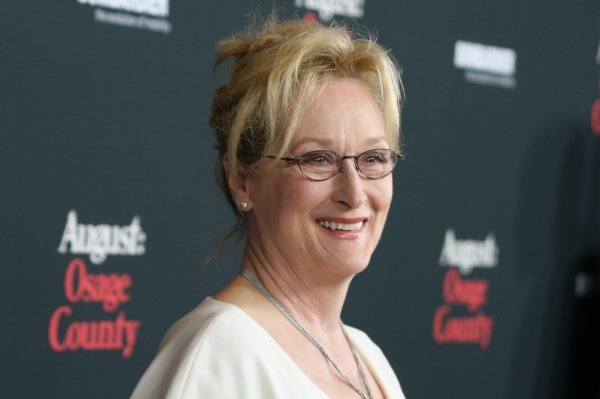 She’s nominated for her record 18th Academy Award for her role in August: Osage County. We can guess who Fiddy’s rooting for.